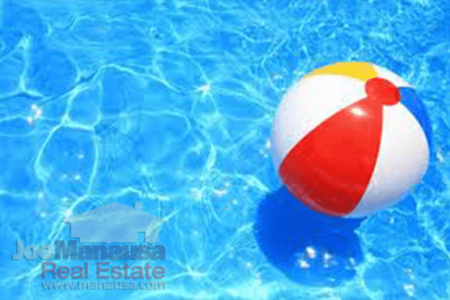 If you are thinking about buying a home with a pool, you likely have hit the market at the right time. Why? Because there appears to be a cycle for how swimming pools affect home values, and thus far in 2015, their impact has been far less than in the past four years. What might be the most surprising for people who are really interested about the impact of swimming pools on home values is that some cycles suggest that a swimming pool might have a negative value on a home. If you are wondering how we determine the impact of swimming pools on the value of a home, there are a few methods. 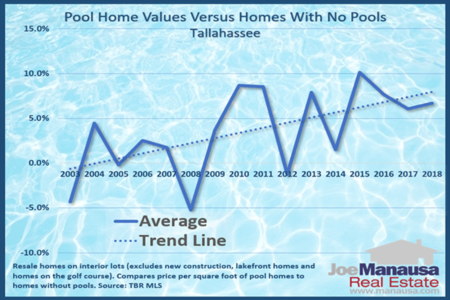 The last time I conducted a comprehensive study on pool homes, I evaluated every home sale in the Tallahassee MLS going back to 2003 and searched for patterns between homes with pools versus those that were pool-less. For this evaluation, I am going to keep it a bit more simple. First of all, this report will evaluate existing home sales only. That means all new construction sales have been removed, because we are more concerned about the resale value of a home rather than its cost to build. Secondly, I have excluded all distressed home sales, as they not a consistently fair determination of value (or condition) of a home. These two simple "rules" for my analysis have allowed me to create the real estate graph below. The filled shaded areas represent value and are measured on the left vertical axis. Green areas represent homes with no pools, while aqua shaded areas represent homes with swimming pools. The bars represent the percentage of value difference between a pool homes and homes with no swimming pools, and they are measured on the right vertical axis. When pool homes sell for more than non-pool homes, the bars are blue and are positive, but when pool homes sell for less than non-pool homes, the bars are red and are negative. The first thing that caught my eye was that there were three years (2006, 2009 & 2010) where homes with pools sold at lower (average) values than homes without pools. Wow, I did not see that coming. If you are looking to buy a home with a pool, you should know that previous buyers this year have been paying about 3% more for homes with pools than they have for homes without pools. But just last year, the "swimming pool premium" was way up at 9% (an all time high), so expect some sellers to be holding out for higher dollars. If you are looking to sell a home with a swimming pool, you should realize that this year's buyers are not that impressed with your pool. Why? I'm not really sure, but the value of a swimming pool to homebuyers does appear to be related to housing market cycles. When buyers are optimistic, they purchase homes with all the bells and whistles they can afford (upgraded kitchens, master baths, swimming pools, lot frontage, etc.) But when buyers become value conscious, they are more concerned with getting the most house for the buck (bedrooms, bathrooms, square footage, garage space, etc.). Currently, buyers appear to be heading back to value-buying, and pool homes are losing favor somewhat. If you have been trying to sell a pool home and nobody is biting, it is likely that you value your pool more than is it valued by homebuyers. With the current swimming pool premium hovering at 3%, it means that buyers see a $200,000 home with a pool being worth $206,000. Want to know what homebuyers think of your home with a swimming pool? We can do a more thorough analysis for your home with homes for sale and sold in your area. Just drop me a note and we'll schedule a time to check out your pool home and help you figure out how to price it to sell for top dollar in today's housing market. Bottom line here in Arizona for buyers we work with is if you want a house with a pool then buy a house with a pool since the cost to build a pool in generally much greater than the value given for an existing pool. An appraiser will likely only give you 50% or less value for a pool compared to a house without one.